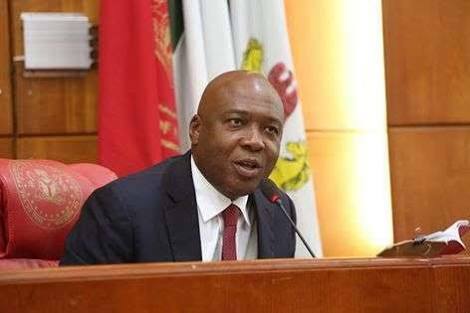 President of the Nigerian Senate, Bukola Saraki has reacted to the Fuel Scarcity rocking the nation and the return of the controversial Fuel Subsidy. In a statement yesterday, Saraki disclosed that an investigation is ongoing into the Subsidy issue and the Scarcity crisis. He also pointed out that a Bigger fraud was going on under the Subsidy scheme, revealing that "the amount of PMS that is allegedly coming into Nigeria cannot be consumed by Nigerians. We consume about 27 million litres a day, while it has been alleged that 40 million litres a day of PMS is being brought in. There is a discrepancy somewhere." "Today, the Senate debated the interim report of the Senate Committee on Downstream Petroleum on the Fuel Scarcity Crisis in the country. This interim report stirred up a debate on the Floor about the ongoing scarcity, the subsidy regime and ways to make the oil and gas sector more efficient. I spent a lot of time on this fuel subsidy issue during the Seventh Senate (2011 to 2015). It was my Motion that brought this topic to the national discourse — hence, it is something that I know a lot about. The first is, even as we speak now, there are still queues. The issue of the ongoing scarcity is one problem that the Committee needs to go back to look into so that Nigerians can be reassured that this will not reoccur. The second problem is that the subsidy is important, however, based on the figures that have been presented, it is clear that there is a bigger fraud that is being perpetrated. This is because the amount of PMS that is allegedly coming into Nigeria cannot be consumed by Nigerians. We consume about 27 million litres a day, while it has been alleged that 40 million litres a day of PMS is being brought in. There is a discrepancy somewhere. At the end of the day, it is Nigerians that are paying for this subsidy fraud because it is not transparent, and it is only being run by one MDA. The third problem has to do with the principle of MDAs incurring expenditures without the necessary approval by the legislature. -While, the issue of unauthorized public spending in the sector will be looked into by the Public Accounts Committee."